I’m a big fan of distraction free writing space, and so far WriteRoom has this market cornered pretty well on Mac OS X.
OmmWriter looks like a worthy contender though, it’s got a beautiful unobtrusive interface and is complete with a relaxing background and subtle peaceful sound effects… if that sounds a little cheesy it sort of is, but it’s actually pretty nice to write in! The goal of OmmWriter is ” a humble attempt to recapture what technology has snatched away from us today: our capacity to concentrate.” and I must say it’s pretty effective at doing this. 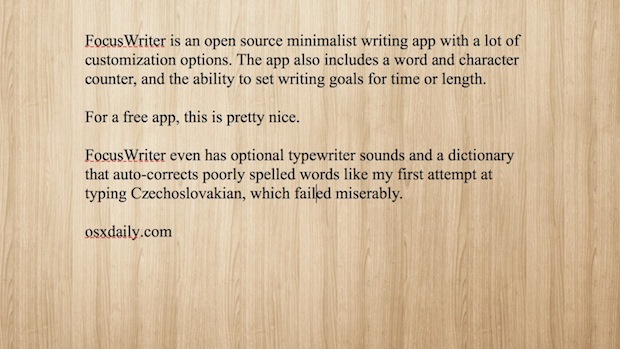 It’s currently in free beta and well worth checking out if you’re a writer of any sort. Be sure to check out the video below to see it in action. Looks like a great piece of software, but just had to comment on the video. Got quite a laugh when the dev got just a few lines in the distraction-free writing app, and started playing with fonts, sizes, backroungs, sounds, etc! HAHAHA! Understandably so, as it’s a demo of his app (which looks awesome by the way), I just know from my level of ADD I’d spend a ton of time playing with the options as well! Not criticizing though, it’s a great looking app! Thanks for the post about it!